Will the real MARVEL SUPER HEROES™ please stand up? Add a new dimension to your MARVEL SUPER HEROES GAME—the third dimension! 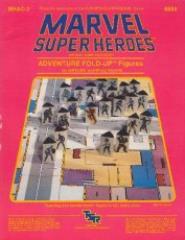 These MARVEL SUPER HEROES ADVENTURE FOLD-UP™ Figures are three-dimensional figures of your favorite heroes and villains. This package includes over 125 figures: the Mighty Avengers™, Fantastic Four™, Uncanny X-Men™, A.I.M.™, Doctor Doom™, Galactus™, and bunches more. You've been waiting for this one, Marvelites—Don't miss it! This package includes four sheets of full-color, fold-up figures and simple, illustrated instructions. Assembly required.